MIXPLANT is a closed cycle continuous plant for mixing, pasteurisation, homogenisation and cooling of ice cream mix. MIXPLANT plants are available with capacities from 300 to 5 000 litres of mix per hour. The great advantege of HTST system is energy recuperation - tap water (milk) cools down the outgoing mix and is heated up - thus the energy requirements are signically reduced. Savings are 70 - 72% compared to the systems without recuperation. plants tailored to individual requirements of each client components of world leading manufacturers wide range of accessories low energy costs of the plant various levels of automation Mixing tank (2 pcs), double speed stirrer, temperature indication Mix lter Centrifugal pump to deliver the mix to the balance tank Balance tank with oater Centrifugal pump to deliver the mix to the heat exchanger Plate heat exchanger, 4 sections Homogenizer with pumping pistons, working pressure 180 bar, single stage Tubular holding unit Control panel with all electricals, temperature display, liter counter display Liter counter to mesure amount of water going to mixing tank, according to the recipe Boiler supply hot water for the pasteurizing section of plate heat exchanger. The hot water can be prepared through electricity / gas or steam Centrifugal pump to deliver the hot water to the heat exchanger. 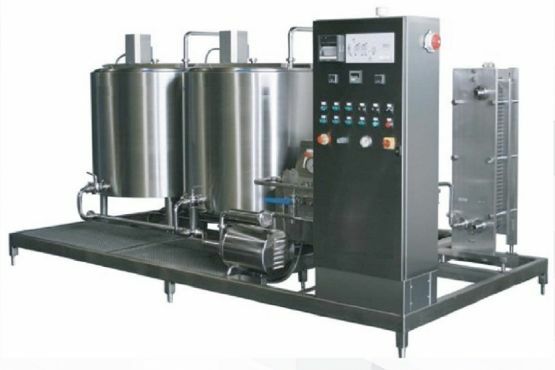 The plant can be completed with following accessories: Powder feeder for dry ingredients Weighing system Fat melting tank Chilled water tank Second homogenizing stage PLC control, automation and optimisationof the process Visualisation of the process Temperature registration.